As you might already know, I rebuilt my site with Laravel in a day. Though the website took shape within a day’s work, I still had many essential features to include, RSS feeds, blog post comments, structured data to name a few. I wanted to explain my solution to implementing an RSS feed. This may be a simple solution but the point is that it works like charm. So let’s get started building an RSS feed for your site. Here’s the gist of my solution. Create a file in your resources/views folder, I called it rss.blade.php. Paste in the code shown below. I’ll explain as we go. As you might notice we pass two variables to this view, $site and $posts. First contains some information about the your site. The second one contains an array of posts you want to include in this feed. Next, we will create the Artisan command that controls the logic. You may ask why write all the logic in a command instead of a controller. I have a few reasons why I chose this method. Since this command generates a file in the public folder there’s no need for requests to go through Laravel. This is pretty basic stuff you should be able to recognize what the code does. First, we create an Artisan command. Then we fetch all the posts sorted by the most recent ones. Next, we create an array with our site details. Then we pass all this data to our rss.blade.php view file, which returns the formatted xml we need. Lastly, we write this to the rss.xml file in our public folder. That was not hard, was it?. The above code allows RSS readers know that there’s an rss feed in this site and points it to the url. 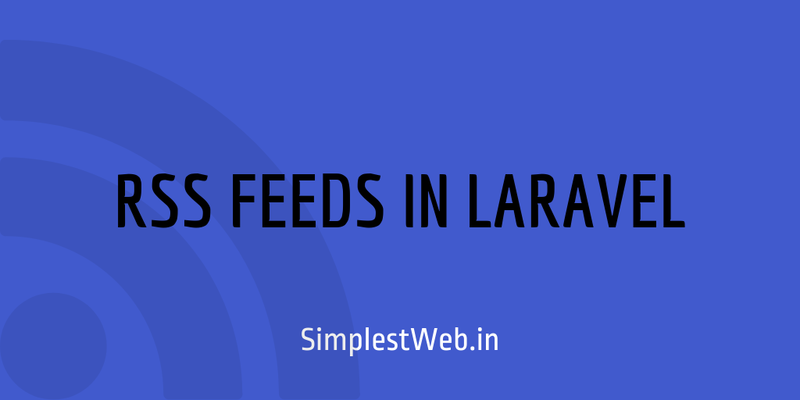 I hope you understood my solution to implementing a RSS Feed for a Laravel site. There a lot more information you can add to this feed, you can find more resources below. If you like this tutorial, do let me know. I will write more of them. If you get stuck anywhere in the tutorial, let me know, I’ll help you.